Important update: swim cancelled due to unsafe water quality. Swim is replaced with 2.5km run starting next to Hilton! The swim (in blue) will be an open water start- swimmers will tread water at the start line until we fire the starting gun. 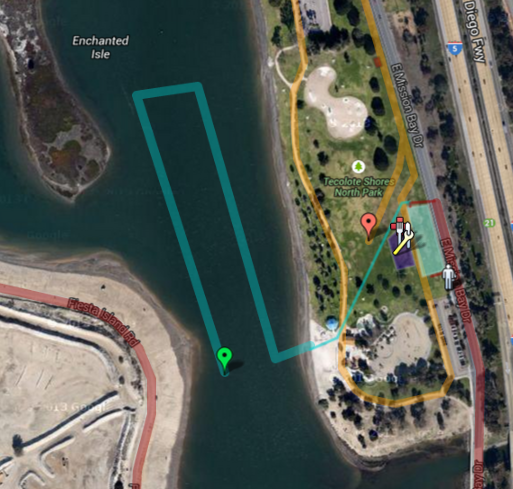 Racers will complete one clockwise circuit in Mission Bay, returning to the beach, and will then cross the grass field (past cheering fans at the expo) and into transition. The bike course (in red) will take our racers to Fiesta Island, where they'll complete 3 laps, then return back to transition. The south-bound lane of E Mission Bay Dr and the entirety of Fiesta Island will be closed to outside traffic for for the duration of the race. This year, racers will head south out of transition and circumnavigate Tecolote Shores park clockwise 3 times. On the third lap, as you approach transition, you will cut across the grass toward the finish line near the expo. The transition (green) and expo (purple) areas will be located side-by-side in a flat, grassy field. It will be made fully accessible for para-athletes wanting to race. We'll have restrooms, aid, food, and sponsor booths ready for you as soon as you finish. There is parking available along E. Mission Bay Drive and in a parking lot north of transition. If you are interested in partnering with us to make the Tritonman experience better, contact us at sponsorship@ucsdtriathlon.org.